A fun story, in three chapters. artist Ken Lum had an exhibition in Rotterdam, Netherlands at the Witte de With Center for Contemporary Art. To promote the exhibit, the museum worked with Lum to reproduce one of his artworks as an outdoor billboard. Although Ken Lum applied the codes of the advertising world to the billboard, it was immediately clear that it wasn’t just any ordinary billboard. After all, the sign wasn’t trying to sell anything. It was just a photo of the friendly, smiling Asian woman sitting at a desk in an office setting. As you can see above, the caption was ‘Melly Shum hates her job’, which occupied the other half of the billboard. That’s all there was. Normally, a billboard would be singing the praises of a product or service that would give Melly Shum more pleasure in her job, or even a job she enjoyed more. However Lum’s billboard just made the announcement that she hates her job. Was it true? The woman had a friendly look on her face, while the word ‘hate’, in red letters next to her, jumped off the billboard at the viewer. The photo and text did not tell the same story, so which of the two was true? Since there was no telephone number, website, price or product shown on the sign, the only thing that remained was the contradiction between image and text. Unlike normal advertisements, this work of art did not provide answers, it merely raised questions. At the conclusion of the show Lum’s artwork from inside the Witte went off to various collections and the billboard came down to make room for an upcoming show’s announcement. The museum responded by immediately returning Melly’s billboard to her spot where she remains today. And tap into something he did. Currently Melly Shum is one of the longest standing billboards (unprecedented), sitting on the corner of Boomgaardstraat and the Witte de Withstraat. You can visit the corner virtually. Jurgen collaborated with a few colleagues and started a venture which they called Happy Melly – a global business network dedicated to happiness at work. I had found myself employed in a place, that while it professed to be progressive, with nice sounding values posted on the walls, it was, how shall I say, not quite so. I’d call it Management 2.0 – Doing some of the right things but in so many wrong ways. I was aware of a great deal of unhappiness – not only in myself, but in my teammates. We had difficulty staying engaged, motivated, innovative. One key indicator was a high staff turnover. Some of you may recognize those symptoms. So I attended an M3.0 workshop, read his books. Utilized many of the M3.0 workout practices with my teams. 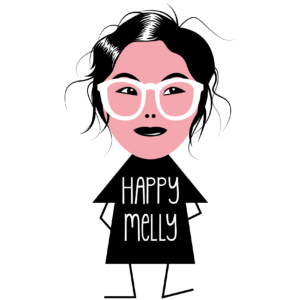 And eventually joined the awesome Happy Melly team myself. Chapter 3: Jurgen, Meet Ken. Ken, Jurgen. Well guess what fun I had one night in August? I managed to get Ken and Jurgen together for coffee I’d arranged for Jurgen to speak at a CTO School Philly Meet Up and thru a little bit of Google detective work, I found out the Ken Lum was on the faculty at the University of Pennsylvania. 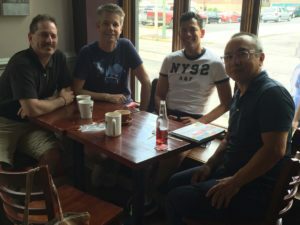 I sent an “out of the blue” email to Ken and much to my pleasure, he agreed to meet up with us at the Green Line Cafe, two blocks from the meet-up’s venue. This was the first time that Ken and Jurgen had ever met and what a memorable moment. We spent about an hour chatting together, covering an amazing range of topics, from Thai cuisine fit for a king to be found in Vancouver and to Melly’s origin story. It turns out the model for the billboard was really named Melly Shum and was a student of Ken’s when he was teaching at the University of Ottawa. We were pleased to hear that today Melly is very happy in her career of 12 years with Tasco Appliances in the Toronto area. We hope Ken enjoyed our company that evening – we certainly did.